Addmaster and Clarisafe bank printer labels. 2.37" wide x 4" high synthetic matte label for use with Clarisafe and IJ25C Printers. 190 labels per roll. 8 rolls per case. Price is per roll. 2.0" wide x 3.0" high label for use with Clarisafe and IJ25C Printers. 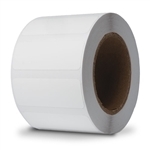 250 labels per roll. 8 rolls per case. Price is per roll. 1.625" wide x 0.375" high label for use with Clarisafe Printer. 1,125 labels per roll. 8 rolls per case. Price is per roll. These labels are the ideal size for labeling medical vials. Continuous Label for ClariSafe Printers. 2.375 inch wide label x variable length.